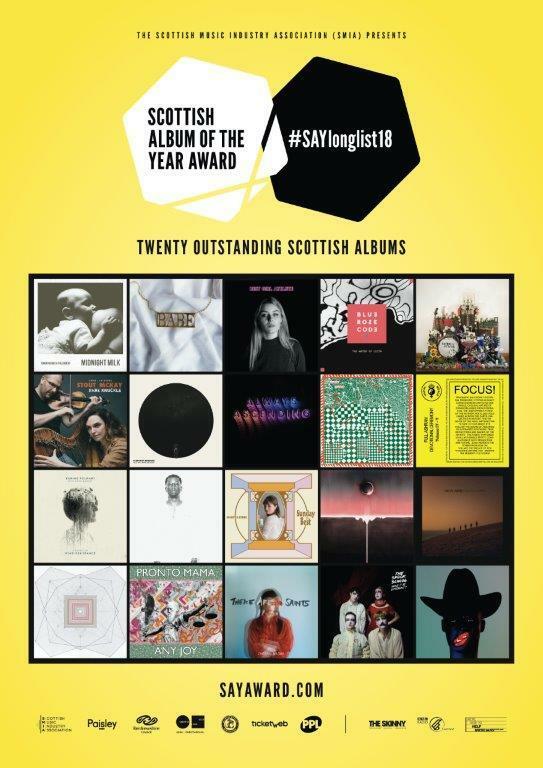 It’s a triumph of the small-scale, richly diverse music scene, with voices like 18 year old Scottish artist Katie Buchan (Best Girl Athlete), sitting next to Kobi Onyame’s hip-hop, and Karine Polwart’s Wind Resistance sound recordings, and relative newcomers Siobhan Wilson and Neon Waltz up against a resurgent Franz Ferdinand and 2014 winners Young Fathers. The strength of the list is its multiform eclecticism: there’s a strong presence from trad artists jostling next to the spacey dub of Golden Teacher and the sparce spiritual Happy Meals (Full Ashram Devotional Ceremony (Volumes IV – VI). The SAY Award Shortlist will be announced on August 23rd before the winner is announced at a ceremony in Paisley on September 6th. Follow the hashtag #SAYaotd to listen to a featured album every day. Artists here doing it for themselves and producing great original music. Good to see Blue Rose Code, Karine Polwart and Stout / McKay on the list. Would be even better if Scotland had a music TV and Radio channel to give a bit more exposure to the talent here. Tom Morton on 60° North and Mixcloud may feature a few. Vic Galloway, Roddy Hart and others do on their respective shows. Think BBC Alba may broadcast SAY event?